Radhey Radhey ...... Such a sweet and loving form of divine energy. Oh my mind, just believe in "Shri Radhey"
Just like people living near Ganga river hardly go there to take a dip...similarly chanting name is such a simple way to attain Krishna, yet we do not understand the value of that. Oh mind! just chant "Radhey......!!" lovingly and thinking name and named are indifferent. An awesome article in glorifying the name of 'Shri Radhey'. Wonderful article. Why would we hesitate to surrender, when Radha Rani is so merciful? Radha Rani runs to grace the fallen when they cry out her name in a pitiable state. She exists in her name! Only the Rashik saints can tell about the most secret Tata:Radha. 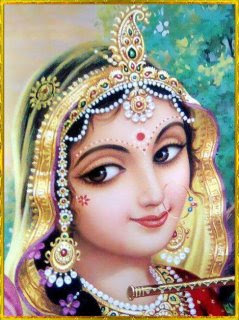 Radha Rani is the soul of the soul of the souls. She is kind hearted, merciful that when ever the fallen soul calls out her from bottom of heart she can't wait but leaves the divine abode and runs to accept her child. Jay shree Radhe. There is no difference between Radha and Radha's name. Both are same. Chat Radhey Radhey and be happy. God resides in it's name when we say Radhey! all the qualities, power and bliss of Shri Radha also exist in Her name. The saints through their cause less grace have given us the treasure of the names like 'Shri Radhey' that by chanting the names we get the divine benefits. We should develop an intense longing and call out Radhey! from our hearts and Radha rani who is always merciful and loving will come running to shower Her grace upon us. Jai Shri Radhey!